There’s something magical about seeing a performer at the top of their game. It’s an indescribable quality that permeates everything they do. For Jack Johnson, the To The Sea tour is a clear apex in his career. With several albums under his belt and some significant changes in his life along the way, Jack Johnson has made the transition from funky surfer guy to a full blown rock star. What makes Jack Johnson so special is that through all that transition, he has managed to maintain the core of who he is as an artist. Even while playing to a packed house at the Sleep Country Amphitheater, Johnson manages to make you feel like you’re seeing him strumming his guitar on the beach after a long day of surfing. Being able to scale that kind of intimate performance is a difficult task and Johnson does it with ease. When it comes to performing, you really can’t fake heart and it was clear as Jack Johnson moved through his cannon of music that he loves what he does. 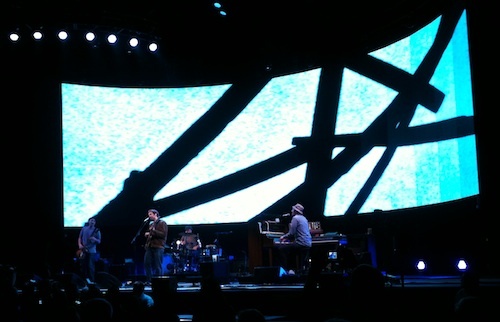 Most artists build anticipation by saving their latest hit for the end of the concert, but Jack Johnson opened with it. As he sang You and Your Heart the crowd leapt to its feet and remained there singing and dancing throughout the concert. In many ways it was like Jack Johnson cared too much to make his audience wait to hear something they really wanted to hear, so he gave it to them right from the start. His demonstrable love for the audience was repeated throughout the show as he stopped to dedicate a song to a father who had a little boy on his shoulders, or as he brought up opener G-Love to have the crowd sing happy birthday to him. But Johnson’s true love that permeates almost everything he does is the ocean. Backed by a towering array of video screens, many of the songs were accompanied by video footage of the ocean and the natural world that surrounds it. Johnson’s love for the sea extends far beyond his music. In a move that is simply unheard of, Johnson donates 100% of the proceeds for the tour to charity through the All At Once Foundation. This foundation supports over 150 local non-profit groups which work for sustainable solutions to help clean rivers and oceans. Most artists who have such a deep commitment to a cause wear that cause on their sleeve. But Johnson, in his extremely cool and understated way, never preaches. Instead, he talks with his actions and its honesty is a much stronger and inspiring way of supporting them. Musically the Jack Johnson concert was perfect. Backed by a three piece band that included a bassist, drummer and pianist, Johnson sounded like a musician at the top of his game. His band echoed Johnson’s comfort and easy with such a full sound you’d swear there were more people on stage. Of particular note was Zach Gill on piano, who played some of the best piano I’ve heard in concert in a while. Some of the real highlights of the evening were the wonderfully emotional Go On, some great freeform jamming with Good People, and the stripped-down love song Tomorrow Morning which Johnson hadn’t played live in several years. I really loved the contrast between the performance of Johnson’s Tomorrow Morning, a sweet, quiet love long that he originally recorded on his girlfriend’s answering machine, and Red Wine, Mistakes, Mythology, a full blown blues jam that highlights Jack Johnson’s musical growth and progression. As wide as the musical range of the Jack Johnson concert was the range in ages at the show. Johnson recorded Sing-A-Longs & Lullabies for the film Curious George in 2006 and that brought his music to a young audience. Those youngsters were peppered throughout the crowd along with their parents and even their grandparents. The rest of the crowd was an eclectic mix that spanned a wide range from twenties to fifties with people from many different circles of life. It was a real treat to be able to see Jack Johnson at such an amazing point in his career and to see an artist performing for all the right reasons. It’s hard to think how the concert could have been better – it was simply that good. The show on 10/3 was the most wonderful musical experience of my life! At times I was moved to tears! Thank you Jack for a magical evening! Got tickets and drove down from Seattle area. Loved the concert, great time!! Does someone have the playlist?